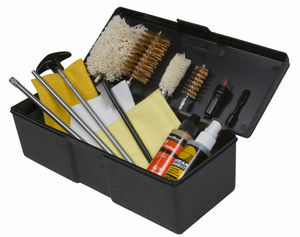 Designed to effectively address the specific cleaning needs of 37mm/40mm launchers and 12 gauge riot chotguns, this Less Lethal kit handles everything from plastic build-up to the toughest fouling. All contents are stored in a reusable polypropylene storage box. 37mm/40mm bore brushes (GLB40) and bore mops (GLM40) are sold seperately. NOTE: Due to regulations this item may not be shipped by air. Please allow longer delivery time.